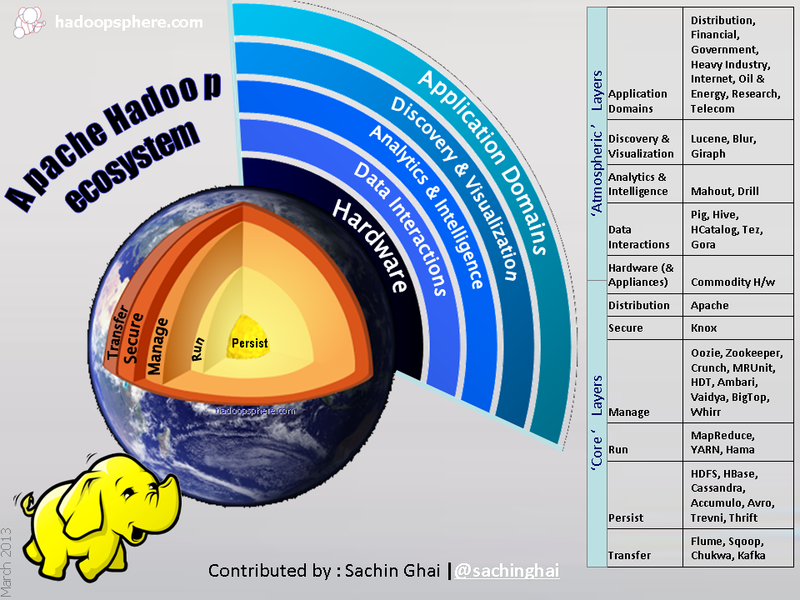 Apache Hadoop ecosystem continues to evolve at a rapid pace with newer projects that are being added as incubators while those currently under incubation are getting ready to graduate out. Let’s visit the current state of open source Apache Hadoop ecosystem. (2) Atmospheric Layers – this category comprises the additional components which provide advanced capabilities and insights for the composite use cases. The nomenclature adopted for categories (core/atmospheric) and layers does not constitute official lingo and are being introduced to demarcate the basic use case versus advanced use cases of Apache Hadoop. As Hadoop distribution matures out along with technology stacks built up by organizations, we expect components and probably even layers to move around from one category to other. Other open source projects/components like Cloudera Impala, Kerberos, Protocol Buffer etc. are not included in this ecosystem diagram since they are not Apache Software Foundation (ASF) projects. Comments and inputs are welcome. You may also download the full size image. Subscribe to hadoopsphere.com and receive free Apache Hadoop ecosystem analyst report in pdf format. If you would like to contribute your content to hadoopsphere.com, click here.